texte de la pétition: Tell the US Government to Protect the Māui Dolphin from Extinction! Tell the US Government to Protect the Māui Dolphin from Extinction! The world's most endangered marine dolphin needs your help. The U.S. is importing seafood from fisheries in New Zealand that deploy types of gear (trawl nets and set gillnets) that are driving New Zealand's Māui dolphin to extinction. As a result, only 57 Māui dolphins remain – the rest have been killed in bycatch. 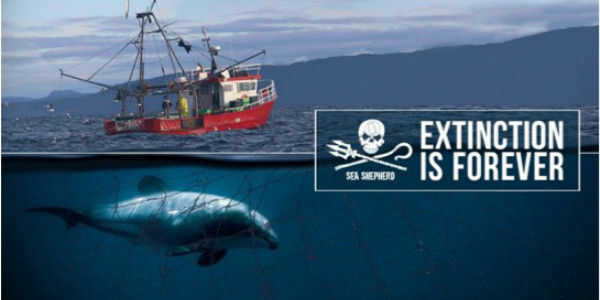 Last month, Sea Shepherd Conservation Society, Sea Shepherd New Zealand, and Sea Shepherd Legal (collectively, Sea Shepherd) formally demanded that the Trump Administration immediately ban all imports from related New Zealand fisheries. The Trump administration responded by asking for public input by March 26, 2019. Here is your chance to save the Māui dolphin from extinction. Please sign this petition by March 26, 2019, demanding that the Trump Administration take action for the Māui dolphin before it is too late. Under the Marine Mammal Protection Act, the U.S. is obligated to prohibit imports from foreign fisheries that fail to prevent bycatch of marine mammals in line with U.S. standards. New Zealand allows for a far greater bycatch of Māui dolphins (2-4 dolphins per year) than would be allowable under the U.S. standard (1 dolphin every 10-23 years). Thus, the U.S. must ban imports from the New Zealand fisheries responsible for the bycatch of Māui dolphins. An import ban will prompt New Zealand to prohibit dangerous gear – an action that New Zealand should have taken years ago. I support Sea Shepherd's call for an immediate ban of imports from New Zealand fisheries responsible for driving the Māui dolphin to extinction. The Marine Mammal Protection Act (MMPA) was designed to prevent species like the Māui dolphin from disappearing from the world's oceans. Congress knew that it could not achieve this goal through regulation of activities in U.S. waters alone. Recognizing that the U.S. is a major seafood importer, Congress, through the MMPA, chose to prohibit imports from foreign fisheries that fail to prevent bycatch of marine mammals in line with U.S. standards. There are few cases so urgent as that of the Māui dolphin. The Scientific Committee of the International Whaling Commission (IWC) estimates that there are only 57 Māui dolphins remaining. There were 2,000 in the early 1970s. This population crash is overwhelmingly the result of bycatch in trawl nets and set gillnets. Unless action is taken immediately, the Māui dolphin will disappear forever. It is also an unfortunate fact that many U.S. consumers are unwittingly complicit in this tragedy. As things stand, U.S. consumers are able to purchase products from offending New Zealand fisheries — fisheries that are directly responsible for the Māui dolphin's collapse — just as easily as they purchase any other product. Fortunately, the MMPA was crafted to address the trade-driven extinction of vulnerable marine mammal populations. Currently, New Zealand applies a totally unacceptable "population sustainability threshold" (PST) standard – meaning that New Zealand tolerates the estimated loss of 2-4 individuals per year from the already extremely small Māui dolphin population. By comparison, the U.S. applies a "potential biological removal" (PBR) standard, which is a conservative measure of the maximum number of individuals that may be removed from a marine mammal population while allowing it to survive as a species. Since the IWC Scientific Committee concluded that "[t]he human-caused death of even one individual would increase the extinction risk," the U.S. must ban the import of imports from New Zealand fisheries responsible for the bycatch of Māui dolphins. We urge you and your colleagues to take the very action that is mandated under the law: ban imports now.